This chapter defines a module intended for use in the representation of primary sources, such as manuscripts or other written materials. Section 11.1 Digital Facsimiles provides elements for handling digitally-encoded images of such materials. This module may also be useful in the preparation of critical editions, but the module defined here is distinct from that defined in chapter 12 Critical Apparatus, and may be used independently of it. Detailed metadata relating to primary sources of any kind may be recorded using the elements defined by the manuscript description module discussed in chapter 10 Manuscript Description, but again the present module may be used independently if such data is not required. Although this chapter discusses manuscript materials more frequently than other forms of written text, most of the recommendations presented are equally applicable mutatis mutandis to the encoding of printed matter or indeed any form of written source, including monumental inscriptions. Similarly, where in the following descriptions terms such as ‘scribe’, ‘author’, ‘editor’, ‘annotator’ or ‘corrector’ are used, these may be re-interpreted in terms more appropriate to the medium being transcribed. In printed material, for example, the ‘compositor’ plays a role analogous to the ‘scribe’, while in an authorial manuscript, the author and the scribe are the same person. These Guidelines are mostly concerned with the preparation of digital texts in which pre-existing sources are transcribed or otherwise converted into character form, and marked up in XML. However, it is also very common practice to make a different form of ‘digital text’, which is instead composed of digital images of the original source, typically one per page, or other written surface. We call such a resource a digital facsimile. A digital facsimile may, in the simplest case, just consist of a collection of images, with some metadata to identify them and the source materials portrayed. It may sometimes contain a variety of images of the same source pages, perhaps of different resolutions, or of different kinds. Such a collection may form part of any kind of document, for example a commentary of a codicological or paleographic nature, where there is a need to align explanatory text with image data. It may also be complemented by a transcribed or encoded version of the original source, which may be linked to the page images. In this section we present elements designed to support these various possibilities and discuss the associated mechanisms provided by these Guidelines. att.global.facs provides an attribute used to express correspondence between an element containing transcribed text and all or part of an image representing that text. facs (facsimile) points to all or part of an image which corresponds with the content of the element. change points to one or more change elements documenting a state or revision campaign to which the element bearing this attribute and its children have been assigned by the encoder. The change attribute is discussed further below in section 11.7 Identifying Changes and Revisions. The facs attribute is used to associate any element in a transcription with an image of the corresponding part of the source, by means of the usual URI pointing mechanism. By convention, this encoding indicates that the image indicated by the facs attribute represents the whole of the text following the pb (pagebreak) element, up to the next pb element. Any convenient milestone element (see further 3.10.3 Milestone Elements) could be used in the same way; for example if the images represent individual columns, the cb element might be used. Though simple, this method has some drawbacks. It does not scale well to more complex cases where, for example, the images do not correspond exactly with transcribed pages, or where the intention is to align specific marked up elements with detailed images, or parts of images. The management of information about the images may become more difficult if references to them are scattered through many files rather than being concentrated in a single identifiable location. Nevertheless, this solution may be adequate for many straightforward ‘digital library’ applications. The recommended approach to encoding facsimiles is instead to use the facs attribute in conjunction with the elements facsimile or sourceDoc, and the elements surface, surfaceGrp, and zone, which are also provided by this module. These elements make it possible to accommodate multiple images of each page, as well as to record the position and relative size of elements identified on any kind of written surface and to link such elements with digital facsimile images of them. Typical applications include the provision of full text search in ‘digital facsimile editions’, and ways of annotating graphics, for example so as to identify individuals appearing in group portraits and link them to data about the people represented. facsimile contains a representation of some written source in the form of a set of images rather than as transcribed or encoded text. sourceDoc contains a transcription or other representation of a single source document potentially forming part of a dossier génétique or collection of sources. surface defines a written surface as a two-dimensional coordinate space, optionally grouping one or more graphic representations of that space, zones of interest within that space, and transcriptions of the writing within them. surfaceGrp defines any kind of useful grouping of written surfaces, for example the recto and verso of a single leaf, which the encoder wishes to treat as a single unit. zone defines any two-dimensional area within a surface element. points [att.coordinated] identifies a two dimensional area within the bounding box specified by the other attributes by means of a series of pairs of numbers, each of which gives the x,y coordinates of a point on a line enclosing the area. Like the text element, a facsimile element may also contain an optional front or back element, used in the same way as described in sections 4.5 Front Matter and 4.7 Back Matter. If desired, the binaryObject element described in 3.9 Graphics and Other Non-textual Components (or any other element from the model.graphicLike class) can be used instead of a graphic. The surface element provides a way of indicating that the two images of page2 represent the same surface within the source material. A surface might be one side of a piece of paper or parchment, an opening in a codex treated as a single surface by the writer, a face of a monument, a billboard, a membrane of a scroll, or indeed any two-dimensional surface, of any size. The surfaceGrp element may also be useful as a means of identifying other groups of written surfaces, such as adjacent faces of a monument, or gatherings of leaves. Simply grouping related graphics is not however the main purpose of the surface element: rather it is to help identify the location and size of the various two-dimensional spaces constituting the digital facsimile. Note that the actual dimensions of the object represented are not provided by the surface element ; rather, the surface element defines an abstract coordinate space which may be used to address parts of the image. Four attributes supplied by the att.coordinated class are used to define this space. att.coordinated provides attributes which can be used to position their parent element within a two dimensional coordinate system. ulx gives the x coordinate value for the upper left corner of a rectangular space. uly gives the y coordinate value for the upper left corner of a rectangular space. lrx gives the x coordinate value for the lower right corner of a rectangular space. lry gives the y coordinate value for the lower right corner of a rectangular space. By default, the same coordinate space is used for a surface and for all of its child elements.40 It may be most convenient to derive a coordinate space from a digital image of the surface in question such that each pixel in the image corresponds with a whole number of units (typically 1) in the coordinate space. In other cases it may be more convenient to use units such as millimetres. Neither practice implies any specific mapping between the coordinate system used and the actual dimensions of the physical object represented. A zone may be used to define any region of interest, such as a detail or illustration, or some part of the surface which is to be aligned with a particular text element, or otherwise distinguished from the rest of the surface. A surface establishes a coordinate system which may be used to address parts or the whole of some digital representation of a written surface. A zone, by contrast, defines any arbitrary area of interest relative to that surface, using the same coordinate system. It might be bigger or smaller than its parent surface, or might overlap its boundaries. The only constraint is that it must be defined using the same coordinate system. When an image of some kind is supplied within either a zone or a surface, the implication is that the image represents the whole of the zone or surface concerned. In the simple case therefore, we might imagine a surface defining a page, within which there is a graphic representing the whole of that page, and a number of zones defining parts of the page, each with its own graphic, each representing a part of the page. If however one of those graphics actually represents an area larger than the page (for example to include a binding or the surface of a desk on which the page rests), then it will be enclosed by a zone with coordinates larger than those of the parent surface. If desired, the binaryObject element described in 3.9 Graphics and Other Non-textual Components (or any other element from the model.graphicLike class) may be used instead of a graphic element. As this example shows, in addition to acting as a container for graphic elements, zone elements may be used to identify parts of a surface for analytical purposes. The relationship between zone and surface can be quite complex: for example, it may be appropriate to treat the whole of a two page spread as a single written surface, perhaps because particular written zones span both pages. A zone may contain a nested surface, if for example a page has an additional scrap of paper attached to it. A zone may be of any shape, not simply rectangular. Discussion of these and other cases are provided in section 11.4 Advanced Uses of surface and zone below. We can now identify distinct zones within the page image using the coordinate scale defined for the surface. 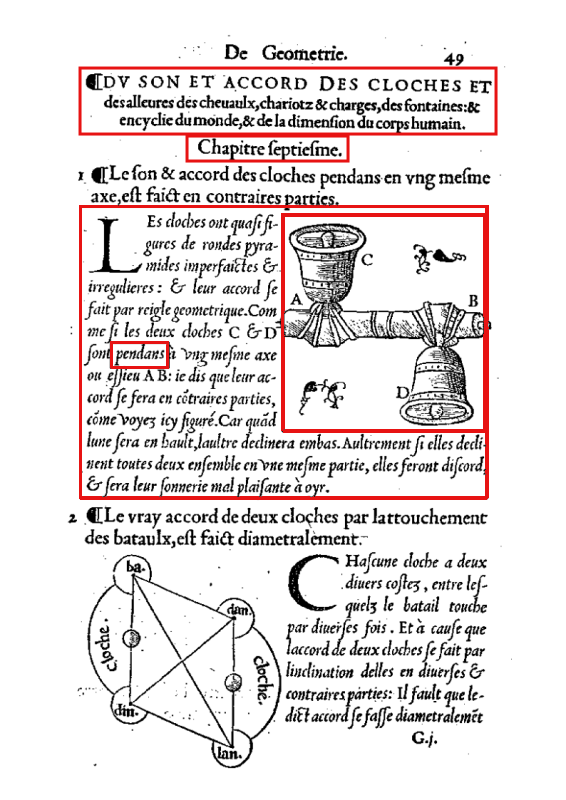 In the following figure Figure 11.2, Detail of p 49r from Bovelles Géometrie Pratique we show the upper part of the page, with boxes indicating four such zones. Each of these will be represented by a zone element, given within the surface element already defined, and specified in terms of the same coordinate system. Some zones of interest are indicated by red lines in the following image. The following encoding defines each of the four zones identified in the figure above. Note that the location of each zone is defined independently but using the same coordinate system. A digitized source document may contain nothing more than page images and a small amount of metadata. It may also contain an encoded transcription of the pages represented, which may either be ‘embedded’ within a sourceDoc element, or supplied in parallel with a facsimile as defined above. If the transcription is regarded as a text in its own right, organized and structured independently of its physical realization in the document or documents represented by the facsimile, then the recommended practice is to use the text element to contain such a structured representation, and to present it in parallel. The text element is a sibling of the facsimile and sourceDoc elements. This approach is illustrated in section 11.2.1 Parallel Transcription below. Alternatively, if the transcription is intended not to prioritize representation of the final text so much as the process by which the document came to take its present form, or the physical disposition of its component parts, it may be preferable to present it as an embedding transcription, as further described in section 11.2.2 Embedded Transcription below. An embedded transcription is one in which words and other written traces are encoded as subcomponents of elements representing the physical surfaces carrying them rather than independently of them. seg (arbitrary segment) represents any segmentation of text below the ‘chunk’ level. The elements surface, surfaceGrp, and zone were introduced above in section 11.1 Digital Facsimiles. When supplied within a sourceDoc element, these elements may contain transcriptions of the written content of a source in addition to or as an alternative to digital images of them. Such transcription may be placed directly within the zone element, or within one or more line elements, for cases where the writing is linear, in the sense that it is composed of discrete tokens organized physically into groups, typically organized in a sequence corresponding with the way they are intended to be read. Depending on the directionality of the writing system used, this might be any combination of top-down and left to right, or vice versa. The element line may be used to hold a complete group of such tokens. Where, however, the lineation is not considered significant, any group of tokens may be indicated using the zone element. The seg element described in section 16.3 Blocks, Segments, and Anchors may also be used to indicate smaller sequences of tokens within zone, or line as appropriate. <line> sont <zone ulx="45" uly="125" lrx="60"
Figure 11.3. Single leaf of notes possibly related to the poem eventually titled Sleepers. 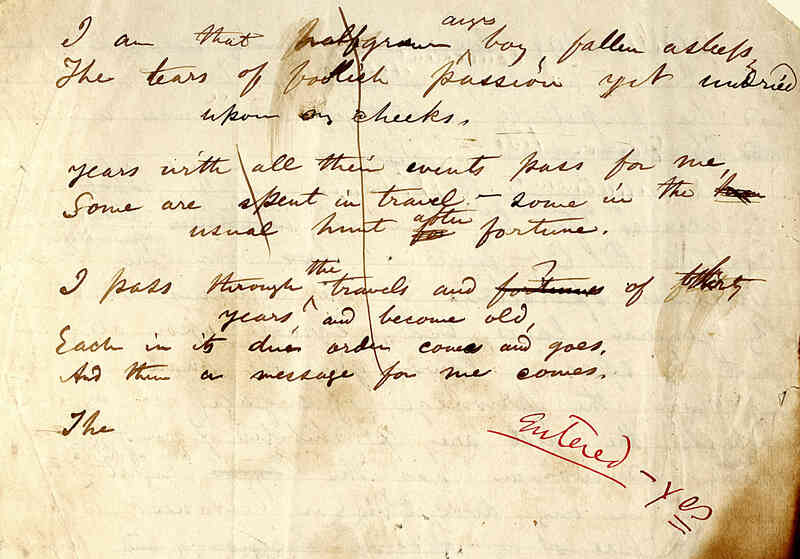 From the Walt Whitman Archive (Duke 258). The two pieces of newsprint might simply be regarded as special kinds of zone, but they are also new surfaces, since they might contain additional written zones themselves (such as the numbers in this case). Note that in this example we have not included any graphic element corresponding with the zone or surface elements identified in the transcription. The encoder may choose to complement a transcription with graphic representations of its source at whatever level is considered effective, or not at all. Equally, the encoder may choose to provide only graphics without any transcription, to provide only a structured (non-embedded) transcription, or to provide any combination of the three. This example also lacks any coordinate information to specify either the size of the two newspaper fragments or whereabouts on the parent surface element they are to be found, other than the reading order implicit in their sequence. Such information could be added if desired by specifying a coordinate system on the outermost surface element, and then indicating values within that system for each of the two fragments, as was discussed above. We discuss this in further detail in section 11.4 Advanced Uses of surface and zone below. When transcribing a primary source, scholars may wish to record information concerning individual readings of letters, words, or larger units, whether the object is simply a ‘neutral’ transcription or a critical edition. In either case they may also wish to include other editorial material, such as comments on the status or possible origin of particular readings, corrections, or text supplied to fill lacunae. Such elements may also be used for digital transcriptions in which the object is not to represent a finished text, but rather to represent the creative process, as evidenced by different ‘layers’ or ‘traces’ of writing in one or more documents. Transcriptions of this kind are closely focussed on the physical appearance of specific documents, needing to distinguish the traces of different writing activities on them, such as additions and deletions but also other indications of how the writing is to be read, such as indications of transposition, re-affirmation of writing which has been deleted, and so on. 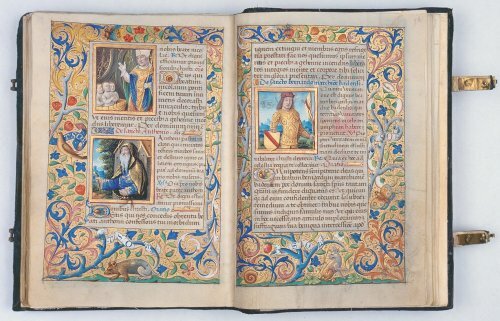 Such distinctions are considered of particular importance when dealing with authorial manuscripts, but are also relevant in the case of historical sources such as charters or other legal documents. The remainder of this chapter describes a model for encoding such transcriptions, in which elements such as mod, del, etc. are used to mark writing traces and their functions within the document. Each such element can be assigned to one or more editorially-defined modification groups, termed a change, by means of a global change attribute, which references a definition for the modification group concerned, typically provided within the TEI header creation element; see further 11.7 Identifying Changes and Revisions. The transcription itself may be embedded within the elements surface and zone described in section 11.1 Digital Facsimiles, or provided in parallel within a text element. Within a zone, the transcription may be organized topographically in terms of lines of writing, using the line element, or in terms of further nested zones, or as a combination of the two; see further 11.2.2 Embedded Transcription. As a rule, all elements which may be used in the course of a transcription of a single witness may also be used in a critical apparatus, i.e. within the elements proposed in chapter 12 Critical Apparatus. This can generally be achieved by nesting a particular reading containing tagged elements from a particular witness within the rdg element in an app structure. Just as a critical apparatus may contain transcriptional elements within its record of variant readings in various witnesses, one may record variant readings in an individual witness by use of the apparatus mechanisms app and rdg. This is discussed in section 12.3 Using Apparatus Elements in Transcriptions. In the detailed transcription of any source, it may prove necessary to record various types of actual or potential alteration of the text: expansion of abbreviations, correction of the text (either by author, scribe, or later hand, or by previous or current editors or scholars), addition, deletion, or substitution of material, and similar matters. The sections below describe how such phenomena may be encoded using either elements defined in the core module (defined in chapter 3 Elements Available in All TEI Documents) or specialized elements available only when the module described in this chapter is available. add (addition) contains letters, words, or phrases inserted in the source text by an author, scribe, or a previous annotator or corrector. choice groups a number of alternative encodings for the same point in a text. corr (correction) contains the correct form of a passage apparently erroneous in the copy text. del (deletion) contains a letter, word, or passage deleted, marked as deleted, or otherwise indicated as superfluous or spurious in the copy text by an author, scribe, or a previous annotator or corrector. expan (expansion) contains the expansion of an abbreviation. gap indicates a point where material has been omitted in a transcription, whether for editorial reasons described in the TEI header, as part of sampling practice, or because the material is illegible, invisible, or inaudible. sic (Latin for thus or so ) contains text reproduced although apparently incorrect or inaccurate. All of these elements bear additional attributes for specifying who is responsible for the interpretation represented by the markup, and the associated certainty. In addition, some of them bear an attribute allowing the markup to be categorized by type and source. att.editLike provides attributes describing the nature of an encoded scholarly intervention or interpretation of any kind. att.source provides attributes for pointing to the source of a bibliographic reference. source provides a pointer to the bibliographical source from which a quotation or citation is drawn. att.global.responsibility provides attributes indicating the agent responsible for some aspect of the text, the markup or something asserted by the markup, and the degree of certainty associated with it. cert (certainty) signifies the degree of certainty associated with the intervention or interpretation. resp (responsible party) indicates the agency responsible for the intervention or interpretation, for example an editor or transcriber. att.typed provides attributes which can be used to classify or subclassify elements in any way. The specific aspect of the markup described by these attributes differs on different elements; for further discussion, see the relevant sections below, especially section 11.3.2.2 Hand, Responsibility, and Certainty Attributes. The following sections describe how the core elements just named may be used in the transcription of primary source materials. The writing of manuscripts by hand lends itself to the use of abbreviation to shorten scribal labour. Commonly occurring letters, groups of letters, words, or even whole phrases, may be represented by significant marks. This phenomenon of manuscript abbreviation is so widespread and so various that no taxonomy of it is here attempted. Instead, methods are shown which allow abbreviations to be encoded using the core elements mentioned above. A manuscript abbreviation may be viewed in two ways. One may transcribe it as a particular sequence of letters or marks upon the page: thus, a ‘p with a bar through the descender’, a ‘superscript hook’, a ‘macron’. One may also interpret the abbreviation in terms of the letter or letters it is seen as standing for: thus, ‘per’, ‘re’, ‘n’. Both of these views are supported by these Guidelines. In many cases the glyph found in the manuscript source also exists in the Unicode character set: for example the common Latin brevigraph ⁊, standing for et and often known as the ‘Tironian et’ can be directly represented in any XML document as the Unicode character with code point U+204A (see further Character References and vi.1. Language Identification). In cases where it does not, these Guidelines recommend use of the g element provided by the gaiji module described in chapter 5 Characters, Glyphs, and Writing Modes. This module allows the encoder great flexibility both in processing and in documenting non-standard characters or glyphs, including the ability to provide detailed documentation and images for them. Note that in each case the g element may contain a suggested replacement for the referenced brevigraph; this is purely advisory however, and may not be appropriate in all cases. The referenced character definitions may be located elsewhere in this or some other document, typically forming part of a charDecl element, as described in 5.2 Markup Constructs for Representation of Characters and Glyphs. ex (editorial expansion) contains a sequence of letters added by an editor or transcriber when expanding an abbreviation. am (abbreviation marker) contains a sequence of letters or signs present in an abbreviation which are omitted or replaced in the expanded form of the abbreviation. while the ex element may be used to indicate those characters within the expansion which are not present in the abbreviated form. As implied in the preceding discussion, making decisions about which of these various methods of representing abbreviation to use will form an important part of an encoder's practice. As a rule, the abbr and am elements should be preferred where it is wished to signify that the content of the element is an abbreviation, without necessarily indicating what the abbreviation may stand for. The ex and expan elements should be used where it is wished to signify that the content of the element is not present in the source but has been supplied by the transcriber, without necessarily indicating the abbreviation used in the original. The decision as to which course of action is appropriate may vary from abbreviation to abbreviation; there is no requirement that the same system be used throughout a transcription, although doing so will generally simplify processing. The choice is likely to be a matter of editorial policy. If the highest priority is to transcribe the text literatim (letter by letter), while indicating the presence of abbreviations, the choice will be to use abbr or am throughout. If the highest priority is to present a reading transcription, while indicating that some letters or words are not actually present in the original, the choice will be to use ex or expan throughout. Observe that the cert and resp attributes are used with the ex element only to indicate confidence in the content of the element (i.e. the expansion), and responsibility for suggesting this expansion respectively. If it is desired to express aspects of certainty and responsibility for some other aspect of the use of these elements, then the mechanisms discussed in chapter 21 Certainty, Precision, and Responsibility should be used. See also 11.3.2.2 Hand, Responsibility, and Certainty Attributes for discussion of the issues of certainty and responsibility in the context of transcription. If more than one expansion for the same abbreviation is to be recorded, multiple notes may be supplied. It may also be appropriate to use the markup for critical apparatus; an example is given in section 12.3 Using Apparatus Elements in Transcriptions. One must have lived longer with this system, to appreciate its advantages. Note that the corr element is used to provide a corrected form which is not present in the source; in the case of a correction made in the source itself, whether scribal, authorial, or by some other hand, the add, del, and subst elements described in 11.3.1.4 Additions and Deletions should be used. the word create for we create nothing <supplied>we</supplied> develope. As with expan and abbr, the choice as to whether to record simply that there is an apparent error, or simply that a correction has been applied, or to record both possible readings within a choice element is left to the encoder. The decision is likely to be a matter of editorial policy, which might be applied consistently throughout or decided case by case. If the highest priority is to present an uncorrected transcription while noting perceived errors in the original, the choice will typically be to use only sic throughout. If the highest priority is to present a reading transcription, while indicating that perceived errors in the original have been corrected, the choice will be to use only corr throughout. Further information may be attached to instances of these elements by the note element and resp and cert attributes. Instances of these elements may also be classified according to any convenient typology using the type attribute. The note element discussed in 3.8 Notes, Annotation, and Indexing may be used to give a more detailed discussion of the motivation for or scope of a correction. If linked by means of a pointer (as in this example) it may be located anywhere convenient within the transcription; typically all detailed notes will be collected together in a separate div element in the back. Alternatively, the pointer may be omitted, and the note placed immediately adjacent to the element being annotated. The advantage of the former solution is that it permits the same annotation to refer to several corrections, by supplying more than one pointer in the target attribute of the note, as shown in the example below. The target attribute on the note element indicates the choice elements which exemplify this kind of scribal error. This necessitates the addition of an identifier to each choice element. However, if the number of corrections is large and the number of notes is small, it may well be both more practical and more appropriate to regard the collection of annotations as constituting a typology and then use the type attribute. Suppose that the note given above is one of half a dozen possible kinds of corrected phenomena identified in a given text; others might include, say, ‘repetition of a word from the preceding line’, etc. The type attribute on the corr element can be used to specify an arbitrary code for the particular kind of correction (or other editorial intervention) identified within it. This code can be chosen freely and is not treated as a pointer. A subtype attribute may be used in conjunction with the type for subclassification purposes: the above examples might thus be represented as <choice type="substitution" subtype="graphicResemblance"> for example. For a given project, it may well be desirable to limit the possible values for the type or subtype attributes automatically. This is easily done but requires customization of the TEI system using techniques described in 23.3 Personalization and Customization, in particular 23.3.1.4 Modification of Attribute and Attribute Value Lists, which should be consulted for further information on this topic. This encoding asserts that the reading wyf found in Gg is regarded as a correction by Parkes. Like the resp attribute, the cert attribute may be used with both corr and rdg elements. When used on the rdg element, these attributes indicate confidence in and responsibility for identifying the reading within the sources specified; when used on the corr element they indicate confidence in and responsibility for the use of the reading to correct the base text. If no other source is indicated (either by the source attribute, or by the wit attribute of a parent rdg), the reading supplied within a corr has been provided by the person indicated by the resp attribute. If it is desired to express certainty of or responsibility for some other aspect of the use of these elements, then the mechanisms discussed in chapter 21 Certainty, Precision, and Responsibility may be found useful. See also 11.3.2.2 Hand, Responsibility, and Certainty Attributes for further discussion of the issues of certainty and responsibility in the context of transcription. att.transcriptional provides attributes specific to elements encoding authorial or scribal intervention in a text when transcribing manuscript or similar sources. seq (sequence) assigns a sequence number related to the order in which the encoded features carrying this attribute are believed to have occurred. hand [att.written] points to a handNote element describing the hand considered responsible for the textual content of the element concerned. If deletions are classified systematically, the type attribute may be useful to indicate the classification; when they are classified by the manner in which they were effected, or by their appearance, however, this will lead to a certain arbitrariness in deciding whether to use the type or the rend attribute to hold the information. In general, it is recommended that the rend attribute be used for description of the appearance or method of deletion, and that the type attribute be reserved for higher level or more abstract classifications. Figure 11.5. Draft letter from Robert Graves to Desmond Flower, 17 Dec 1938 (detail). The word ‘O.E.D.’ in this first sentence has also clearly been the result of some redrafting: it may be that Graves started to write ‘Oxford’, and then changed it; it may be that he inserted other punctuation marks between the letters before replacing them with the centre dots used elsewhere to represent this acronym. We do not deal with these possibilities here, and mention them only to indicate that any encoding of manuscript material of this complexity will need to make decisions about what is and is not worth mentioning. An encoder may also wish to indicate that an addition replaces a specific deletion, that is to encode a substitution as a single intervention in the text. This may be achieved by grouping the addition and deletion together within a subst element. At the end of the passage illustrated above, Graves first writes ‘It is the expressed...’, then deletes ‘It is’, and substitutes an uppercase T at the start of ‘the’. The use of this element and of the seq attribute to indicate the order in which interventions such as deletions are believed to have occurred are further discussed in section 11.3.1.5 Substitutions below. The add and del elements defined in the core module suffice only for the description of additions and deletions which fit within the structure of the text being transcribed, that is, which each deletion or addition is completely contained by the structural element (paragraph, line, division) within which it occurs. Where this is not the case, for example because an individual addition or deletion involves several distinct structural subdivisions, such as poems or prose items, or otherwise crosses a structural boundary in the text being encoded, special treatment is needed. The addSpan and delSpan elements are provided by this module for that purpose. (For a general discussion of the issue see further 20 Non-hierarchical Structures). In this case the anchor and delSpan have been placed within the structural elements (the ls) rather than between, as in the previous example. This is to indicate that placement of these empty elements is arbitrary. The text deleted must be at least partially legible, in order for the encoder to be able to transcribe it. If all of part of it is not legible, the gap element should be used to indicate where text has not been transcribed, because it could not be. The unclear element described in section 11.3.3.1 Damage, Illegibility, and Supplied Text may be used to indicate areas of text which cannot be read with confidence. See further section 11.3.1.7 Text Omitted from or Supplied in the Transcription and section 11.3.3.1 Damage, Illegibility, and Supplied Text. Substitution of one word or phrase for another is perhaps the most common of all phenomena requiring special treatment in transcription of primary textual sources. It may be simply one word written over the top of another, or deletion of one word and its replacement by another written above it by the same hand on the same occasion; the deletion and replacement may be done by different hands at different times; there may be a long chain of substitutions on the same stretch of text, with uncertainty as to the order of substitution and as to which of many possible readings should be preferred. As we have shown, the simplest method of recording a substitution is simply to record both the addition and the deletion. However, when the module defined by this chapter is in use, additional elements are available to indicate that the encoder believes the addition and the deletion to be part of the same intervention: a substitution. subst (substitution) groups one or more deletions with one or more additions when the combination is to be regarded as a single intervention in the text. Since the purpose of this element is solely to group its child elements together, the order in which they are presented is not significant. When both deletion and addition are present, it may not always be clear which occurs first: using the seq attribute is a simple way of resolving any such ambiguities. </subst> system, to appreciate its advantages. Note the nesting of an add element within a del to record text first added, then deleted in the source. The numbers assigned by the seq attribute may be used to identify the order in which the various additions and deletions are believed by the encoder to have been carried out, and thus provide a simple method of supporting the kind of ‘genetic’ textual criticism typified by (for example) Hans Walter Gabler's work on the reconstruction of the ‘overlay’ levels implicit in the manuscripts of James Joyce's Ulysses. A fuller and more complex way of supporting such an approach is discussed in 11.7 Identifying Changes and Revisions. Note that, unlike subst, the placement of the substJoin is arbitrary. It may occur before or after the relevant add and del elements. Figure 11.6. Detail from Dulce et decorum est autograph manuscript in the English Faculty Library, Oxford University. the authorial slip (amongt for amongst) is retained without comment. the other two authorial corrections are marked as substitutions, each combining a deletion and an addition. </app> system, to appreciate its advantages. restore indicates restoration of text to an earlier state by cancellation of an editorial or authorial marking or instruction. This element bears the same attributes as the other transcriptional elements. These may be used to supply further information such as the hand in which the restoration is carried out, the type of restoration, and the person responsible for identifying the restoration as such, in the same way as elsewhere. For I hate this <restore hand="#dhl"
Another feature commonly encountered in manuscripts is the use of circles, lines, or arrows to indicate transposition of material from one point in the text to another. No specific markup for this phenomenon is proposed at this time. Such cases are most simply encoded as additions at the point of insertion and deletions at the point of encirclement or other marking. Where text is not transcribed, whether because of damage to the original, or because it is illegible, or for some other reason such as editorial policy, the gap core element may be used to register the omission; where such text is transcribed, but the editor wishes to indicate that they consider it to be superfluous, for example because it is an inadvertent scribal repetition or an interpolation from another source, the surplus element may be used in preference. Where the editor believes text to be interpolated but genuine, the secl element may be used instead. Where text not present in the source is supplied (whether conjecturally or from other witnesses) to fill an apparent gap in the text, the supplied element may be used. reason gives the reason for omission. Sample values include sampling, inaudible, irrelevant, cancelled. hand in the case of text omitted from the transcription because of deliberate deletion by an identifiable hand, indicates the hand which made the deletion. surplus marks text present in the source which the editor believes to be superfluous or redundant. reason one or more words indicating why this text is believed to be superfluous, e.g. repeated, interpolated etc. secl (secluded text) Secluded. Marks text present in the source which the editor believes to be genuine but out of its original place (which is unknown). reason one or more words indicating why this text has been secluded, e.g. interpolated etc. supplied signifies text supplied by the transcriber or editor for any reason; for example because the original cannot be read due to physical damage, or because of an obvious omission by the author or scribe. reason one or more words indicating why the text has had to be supplied, e.g. overbinding, faded-ink, lost-folio, omitted-in-original. I am dr Sr yr <gap reason="illegible" quantity="3"
The degree of precision attempted when measuring the size of a gap will vary with the purpose of the encoding and the nature of the material: no particular recommendation is made here. As noted above, the gap element should only be used where text has not been transcribed. 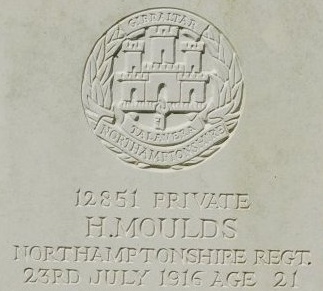 If partially legible text has been transcribed, one of the elements damage and unclear should be used instead (these elements are described in section 11.3.3.1 Damage, Illegibility, and Supplied Text); if the text is legible and has been transcribed, but the editor wishes to indicate that they regard it is superfluous or redundant, then the element surplus may be used in preference to the core element sic used to indicate text regarded as erroneous. The words marked as surplus here are metrically inconsistent with the rest and have been marked by the editor as such. The final line is bracketed in the Loeb edition, with a note: ‘versum secl. Bothe’, meaning Bothe regarded this line as Plautine, but probably interpolated. It is easy to see how the line might have crept in as a gloss on the metaphor in the previous line. Here the source and resp attributes are used, as elsewhere, to indicate respectively the sigil of a manuscript from which the supplied reading has been taken, and the identifier of the person responsible for deciding to supply the text. If the source attribute is not supplied, the implication is that the encoder (or whoever is indicated by the value of the resp attribute) has supplied the missing reading. Both gap and supplied may be used in combination with unclear, damage, and other elements; for discussion, see section 11.3.3.2 Use of the gap, del, damage, unclear, and supplied Elements in Combination. This section discusses in more detail the representation of aspects of responsibility perceived or to be recorded for the writing of a primary source. These include points at which one scribe takes over from another, or at which ink, pen, or other characteristics of the writing change. A discussion of the usage of the hand, resp, and cert attributes is also included. For many text-critical purposes it is important to signal the person responsible (the hand) for the writing of a whole document, a stretch of text within a document, or a particular feature within the document. A hand, as the name suggests, need not necessarily be identified with a particular known (or unknown) scribe or author; it may simply indicate a particular combination of writing features recognized within one or more documents. The examples given above of the use of the hand attribute with coding of additions and deletions illustrate this. The handNote element is used to provide information about each hand distinguished within the encoded document. handNote (note on hand) describes a particular style or hand distinguished within a manuscript. A handNote element, with an identifier given by its xml:id attribute, may appear in either of two places in the TEI header, depending on which modules are included in a schema. When the transcr module defined by the present chapter is used, the element handNotes is available, within the profileDesc element of the TEI header, to hold one or more handNote elements. When the msdescription module defined in chapter 10 Manuscript Description is included, the handDesc element described in 10.7.2 Writing, Decoration, and Other Notations also becomes available as part of a structured manuscript description. The encoder may choose to place handNote elements identifying individual hands in either location without affecting their accessibility since the element is always addressed by means of its xml:id attribute. The handDesc element may be more appropriate when a full cataloguing of each manuscript is required; the handNotes element if only a brief characterization of each hand is needed. It is also possible to use the two elements together if, for example, the handDesc element contains a single summary describing all the hands discursively, while the handNotes element gives specific details of each. The choice will depend on individual encoders' priorities. As shown above, the hand attribute is available on several elements to indicate the hand in which the content of the element (usually a deletion or addition) is carried out. The handShift element may also be used within the body of a transcription to indicate where a change of hand is detected for whatever reason. handShift marks the beginning of a sequence of text written in a new hand, or the beginning of a scribal stint. att.handFeatures provides attributes describing aspects of the hand in which a manuscript is written. scribe gives a name or other identifier for the scribe believed to be responsible for this hand. script characterizes the particular script or writing style used by this hand, for example secretary, copperplate, Chancery, Italian, etc. scribeRef points to a full description of the scribe concerned, typically supplied by a person element elsewhere in the description. scriptRef points to a full description of the script or writing style used by this hand, typically supplied by a scriptNote element elsewhere in the description. scope specifies how widely this hand is used in the manuscript. A single hand may employ different writing styles and inks within a document, or may change character. For example, the writing style might shift from ‘anglicana’ to ‘secretary’, or the ink from blue to brown, or the character of the hand may change. Simple changes of this kind may be indicated by assigning a new value to the appropriate attribute within the handShift element. It is for the encoder to decide whether a change in these properties of the writing style is so marked as to require treatment as a distinct hand. Where such a change is to be identified, the new attribute indicates the hand applicable to the material following the handShift. The sequence of such handShift elements will often, but not necessarily, correspond with the order in which the material was originally written. Where this is not the case, the facilities described in section 11.7 Identifying Changes and Revisions may be found helpful. As might be expected, a single hand may also vary renditions within the same writing style, for example medieval scribes often indicate a structural division by emboldening all the words within a line. Such changes should be indicated by use of the rend attribute, in the same manner as underlining, emboldening, font shifts, etc. are represented in transcription of a printed text, rather than by introducing a new handShift element. When a more precise or nuanced discussion of the writing in a manuscript is required, the handNote and scriptNote elements discussed in 10.7.2 Writing, Decoration, and Other Notations should be used. Either element may serve as the target for a handShift. 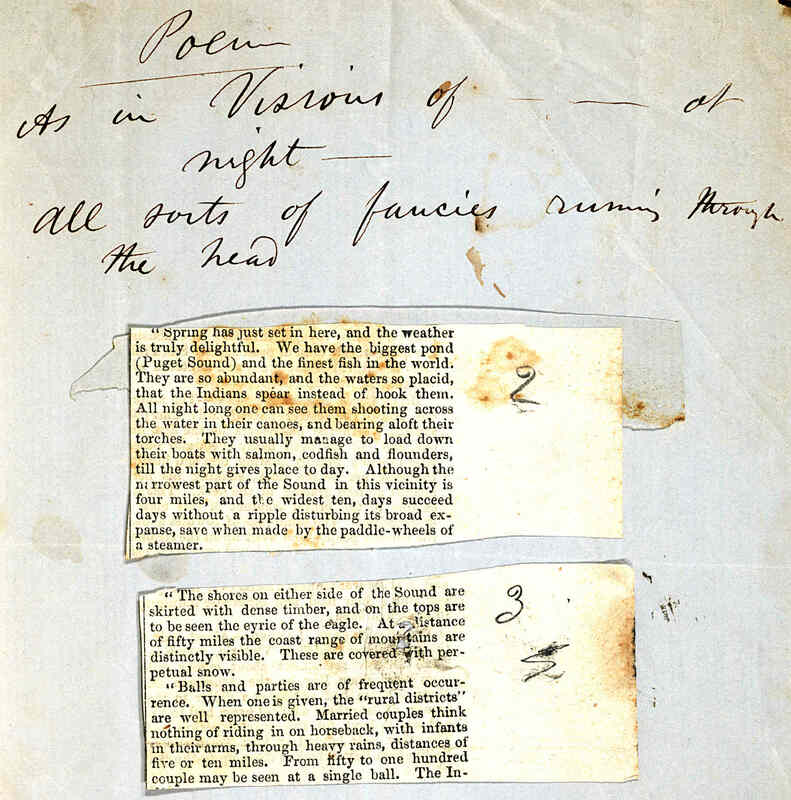 As in this example, hand should be reserved for indicating the hand of any form of marking—here, addition but also deletion, correction, annotation, underlining, etc.—within the primary text being transcribed. The scribal or authorial responsibility for this marking may be inferred from the value of the hand attribute. The value of the hand attribute should be a pointer to a hand identifiers typically declared in the document header but potentially in another document or repository (see section 11.3.2.1 Document Hands). The resp attribute, by contrast, indicates the person responsible for deciding to mark up this part of the text with this particular element. In the case of the add element, for example, the resp attribute will indicate the responsibility for identifying that the addition is indeed an addition, and also (if the hand attribute is supplied) to which hand it should be attributed. In this case, Bowers is credited with identifying the hand as that of William James. In the case of the corr element, the resp attribute indicates who is responsible for supplying the intellectual content of the correction reported in the transcription: here, Bowers' correction of ‘One’ to ‘one’. In the case of a deletion, the resp attribute will similarly indicate who bears responsibility for identifying or categorizing the deletion itself, while other attributes (hand most obviously) attribute responsibility for the deletion itself. In cases where both the resp and cert attributes are defined for a particular element, the two attributes refer to the same aspect of the markup. The one indicates who is intellectually responsible for some item of information, the other indicates the degree of confidence in the information. Thus, for a correction, the resp attribute signifies the person responsible for supplying the correction, while the cert attribute signifies the degree of editorial confidence felt in that correction. For the expansion of an abbreviation, the resp attribute signifies the person responsible for supplying the expansion and the cert attribute signifies the degree of editorial confidence felt in the expansion. This close definition of the use of the resp and cert attributes with each element is intended to provide for the most frequent circumstances in which encoders might wish to make unambiguous statements regarding the responsibility for and certainty of aspects of their encoding. The resp and cert attributes, as so defined, give a convenient mechanism for this. However, there will be cases where it is desirable to state responsibility for and certainty concerning other aspects of the encoding. For example, one may wish in the case of an apparent addition to state the responsibility for the use of the add element, rather than the responsibility for identifying the hand of the addition. It may also be that one editor may make an electronic transcription of another editor's printed transcription of a manuscript text—here, one will wish to assign layers of responsibility, so as to allow the reader to determine exactly what in the final transcription was the responsibility of each editor. In these complex cases of divided editorial responsibility for and certainty concerning the content, attributes, and application of a particular element, the more general mechanisms for representing certainty and responsibility described in chapter 21 Certainty, Precision, and Responsibility should be used. The choice of which mechanism to use is left to the encoder. In transcriptions where only such statements of responsibility and certainty are made as can be accommodated within the resp and cert attributes of particular elements, it will be economical to use the resp and cert attributes of those elements. Where many statements of responsibility and certainty are made which cannot be so accommodated, it may be economical to use the respons and certainty elements throughout. The above discussion supposes that in each case an encoder is able to specify exactly what it is that one wishes to state responsibility for and certainty about. Situations may arise when an encoder wishes to make a statement concerning certainty or responsibility but is unable or unwilling to specify so precisely the domain of the certainty or responsibility. In these cases, the note element may be used with the type attribute set to ‘cert’ or ‘resp’ and the content of the note giving a prose description of the state of affairs. The carrier medium of a primary source may often sustain physical damage which makes parts of it hard or impossible to read. In this section we discuss elements which may be used to represent such situations and give recommendations about how these should be used in conjunction with the other related elements introduced previously in this chapter. damageSpan (damaged span of text) marks the beginning of a longer sequence of text which is damaged in some way but still legible. att.damaged provides attributes describing the nature of any physical damage affecting a reading. degree provides a coded representation of the degree of damage, either as a number between 0 (undamaged) and 1 (very extensively damaged), or as one of the codes high, medium, low, or unknown. The damage element with the degree attribute should only be used where the text may be read with some confidence; text supplied from other sources should be tagged as supplied. group assigns an arbitrary number to each stretch of damage regarded as forming part of the same physical phenomenon. extent indicates the size of the object concerned using a project-specific vocabulary combining quantity and units in a single string of words. min where the measurement summarizes more than one observation or a range, supplies the minimum value observed. max where the measurement summarizes more than one observation or a range, supplies the maximum value observed. atLeast gives a minimum estimated value for the approximate measurement. atMost gives a maximum estimated value for the approximate measurement. The following examples all refer to the recto of folio 5 of the unique manuscript of the Elder Edda. Here, the manuscript of Vóluspá has been damaged through irregular rubbing so that letters in various places are obscured and in some cases cannot be read at all. If, as is often the case, the damage crosses structural divisions, so that the damage element cannot be nested properly within the containing div elements, the damageSpan element may be used, in the same way as the delSpan and addSpan elements discussed in section 11.3.1.4 Additions and Deletions. Note that in this example the spanTo element points to the next pb element rather than to an inserted anchor element, since it is the whole of the leaf (the text between the two pb elements) which has sustained damage. For other techniques of handling non-nesting information, see chapter 20 Non-hierarchical Structures. A more general solution to this problem is provided by the join element discussed in 16.7 Aggregation which may be used to link together arbitrary elements of any kind in the transcription. Here, several phenomena of illegibility and conjecture all result from a single cause: an area of damage to the text caused by rubbing at various points. The damage is not continuous, and affects the text at irregular points. In cases such as this, the join element may be used to indicate which tagged features are part of the same physical phenomenon. dreki fliugandi naþr frann neþan <gap reason="illegible" agent="rubbing"
As with supplied, this gap might be enclosed by a damage element. The above examples record imperfect legibility due to damage. When imperfect legibility is due to some other reason (typically because the handwriting is ill-formed), the unclear element should be used without any enclosing damage element. In Robert Southey's autograph of The Life of Cowper the final six letters of attention are difficult to read because of the haste of the writing, though reasonably certain from the context. The cert attribute on the unclear element may be used to indicate the level of editorial confidence in the reading contained within it. where the text has been rendered completely illegible by deletion or damage and no text is supplied by the editor in place of what is lost: place an empty gap element at the point of deletion or damage. Use the reason attribute to state the cause (damage, deletion, etc.) of the loss of text. where the text has been rendered completely illegible by deletion or damage and text is supplied by the editor in place of what is lost: surround the text supplied at the point of deletion or damage with the supplied element. Use the reason attribute to state the cause (damage, deletion, etc.) of the loss of text leading to the need to supply the text. where the text has been rendered partly illegible by deletion or damage so that the text can be read but without perfect confidence: transcribe the text and surround it with the unclear element. Use the reason attribute to state the cause (damage, deletion, etc.) of the uncertainty in transcription and the cert attribute to indicate the confidence in the transcription. where there is deletion or damage but at least some of the text can be read with perfect confidence: transcribe the text and surround it with the del element (for deletion) or the damage element (for damage). Use appropriate attribute values to indicate the cause and type of deletion or damage. Observe that the degree attribute on the damage element permits the encoding to show that a letter, word, or phrase is not perfectly preserved, though it may be read with confidence. where there is an area of deletion or damage and parts of the text within that area can be read with perfect confidence, other parts with less confidence, other parts not at all: in transcription, surround the whole area with the del element (for deletion; or the delSpan element where it crosses a structural boundary); or the damage element (for damage). Text within the damaged area which can be read with perfect confidence needs no further tagging. Text within the damaged area which cannot be read with perfect confidence may be surrounded with the unclear element. Places within the damaged area where the text has been rendered completely illegible and no text is supplied by the editor may be marked with the gap element. For each element, one may use appropriate attribute values to indicate the cause and type of deletion or damage and the certainty of the reading. Modifications of various kinds (correction, addition, deletion, etc.) are frequently found within a single document, and may also be inferred when different documents are compared, although it may be an open question as to whether inter-document discrepancies should be regarded in the same way as intra-document alterations. When two witnesses are collated, we may observe that a word present in one is missing from the other: this does not necessarily imply that the word was added to the first witness, nor that it was deleted from the other. In this section we discuss a number of elements which may be useful when attempting to record traces of the writing process within a document. Most, if not all, transcriptional elements imply a certain level of semantic interpretation. For instance, using the add element to encode a word or phrase that occupies interlinear space involves a decision that it has been deliberately inserted as an addition rather than an alternative, and indeed a judgment that it was written after, rather than before, the other lines. Where it is felt desirable to keep the recording of ‘what is on the page’ entirely separate from ‘what is the editor’s interpretation’, the generic mod element may be preferred. mod represents any kind of modification identified within a single document. This element simply indicates any kind of modification that has been identified in the document, without prejudice as to its function. Occurrences of the mod element may be categorized by means of their type attribute, and visual aspects of their appearance can be described by means of the rend attribute, but they provide no further interpretation of the function or intention of the passage so marked up. The spanTo attribute may be used to indicate the end of a modified passage if this extends across the boundaries of some other XML element, for example from the middle of one line tagged as a line to the middle of another line some distance further on in the document. <line>words words words <mod rend="wavy-underlining"
The distinction between an example such as that above and the simple use of hi to mark the visual salience of the underlining (apart from the use of the spanTo attribute) is that hi does not imply that the visual effect being recorded is understood to represent some kind of modification. metamark contains or describes any kind of graphic or written signal within a document the function of which is to determine how it should be read rather than forming part of the actual content of the document. function describes the function (for example status, insertion, deletion, transposition) of the metamark. target identifies one or more elements to which the metamark applies. Unlike marginal notes or other additions to the text, metamarks are used by the writer to indicate a deliberate alteration of the writing itself, such as ‘move this passage over there’. An addition or annotation by contrast would typically concern some property of the passage other than its intended location or status within the text flow. A metamark may contain text, or some other graphic which the encoder wishes to represent, or it may simply consist of arrows, dots, lines etc. which the encoder simply describes. The metamark element carries a function attribute which specifies the function of the metamark, using values such as reorder, flag, delete, insert or used. The passage to which the metamark applies may be indicated in either of two ways: the target attribute may be used to point to the element or elements containing the passage concerned, or the spanTo element may be used to point to a position in the document at which the passage concerned finishes. In the latter case, the metamark itself must be supplied at the position in the document where the passage concerned begins; in the former case it may be supplied at any convenient point. Both attributes should not be supplied. Figure 11.7. Kundige bok 2, fol 1v. The change attribute used here to indicate the sequencing of these various interventions is discussed below, in section 11.7 Identifying Changes and Revisions. The elements addSpan and delSpan are discussed in section 11.3.1.4 Additions and Deletions. 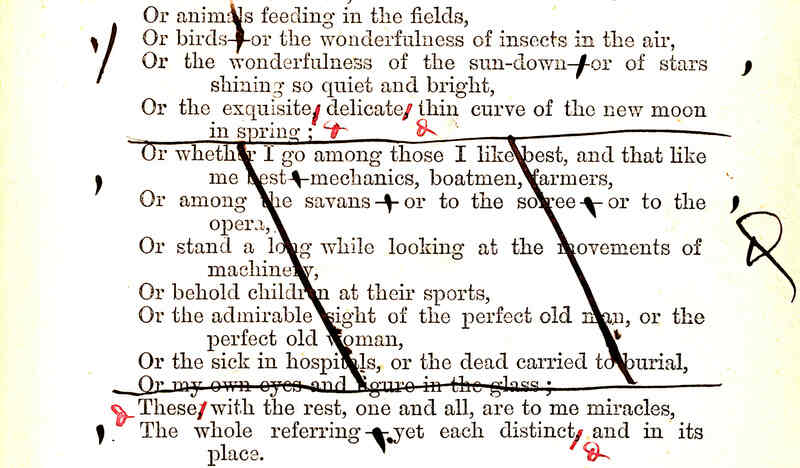 In this example, the whole of what was originally the 14th section of the poem has been marked for deletion, both by horizontal and vertical lines, and by the proofreading mark resembling the ‘deleatur’ or ‘dele’ deletion symbol to left and right of the section. The deletion itself might be encoded by using the normal del or delSpan element, and the metamarks by the metamark element. This is quite a different case from that of the next example, in which the writer does not intend to suppress the content, but only to mark that it has been copied to another manuscript or reused. Figure 11.9. From "I am that halfgrown angry boy" (MS q 25), David M. Rubenstein Rare Book & Manuscript Library, Duke University. This page contains internal deletions, additions, and retracings but these are semantically quite different from the apparent ‘deletion’ signalled by the larger of the two single vertical lines, which shows that the written material has been transferred or re-used, not deleted. In this example, we class as metamarks both the long vertical line and the annotation ‘Entered - yes’. Both metamarks are assumed to indicate that the whole of the written zone with identifier X2 is marked as having been used. A writer may sometimes rewrite material a second time without significant change and in the same place. We consider this a distinct activity from addition as usually defined because no new textual material results; instead the status of existing material is reaffirmed. We may distinguish two variants of this: fixation where the first version was a tentative draft which is subsequently reaffirmed, for example by inking it over; and clarification, where the first version was badly written and has been rewritten for clarity. The element retrace is provided for both cases; its cause attribute may be used to distinguish these or other cases. retrace contains a sequence of writing which has been retraced, for example by over-inking, to clarify or fix it. The change attribute used here is discussed further below (11.7 Identifying Changes and Revisions). The retrace element is used only for cases where text has been written multiple times. When metamarks and other markup-like strokes have been rewritten multiple times, the redo element described in the next section should be used in preference. A writer may indicate that an alteration is itself to be altered: for example, a struck-through passage may be restored via a dotted underlining, or the underlining of a passage may be deleted by a wavy line. redo indicates one or more cancelled interventions in a document which have subsequently been marked as reaffirmed or repeated. target points to one or more elements representing the interventions which are being reasserted. undo indicates one or more marked-up interventions in a document which have subsequently been marked for cancellation. target points to one or more elements representing the interventions which are to be reverted or undone. The element restore (11.3.1.6 Cancellation of Deletions and Other Markings) is provided for the comparatively simple case where a simple deletion is marked as having been subsequently cancelled. The undo element discussed here is more widely applicable and may be used for any kind of cancellation. It points to the element or elements which are being cancelled. These components need not be contiguous, provided that the cancellation is clearly a single act; each distinct act of cancellation requires a distinct undo element, however. Either of the attributes target or spanTo may be used to indicate the passages concerned. This is just some sample text, we need a real example. This is not a real example. This is just some text, not a real example. change="#s3"/>just some <anchor xml:id="Xa"/> sample <undo spanTo="#Xb" rend="dotted"
using two undo elements, each with a spanTo attribute, to delimit the two parts of the deletion which were reverted at change s3. Note that in this case, since target is not supplied, it is the effect of the parent element (the del) which is assumed to be undone. transpose describes a single textual transposition as an ordered list of at least two pointers specifying the order in which the elements indicated should be re-combined. When transposition is made, the whole element indicated is understood to be moved, not just its contents. In the above example, the metamarks are thus understood to be moved along with the lines to which they apply. One or more listTranspose elements may be supplied either embedded within the text or in the profileDesc of the header, depending on local preference. Each listTranspose can contain one or more transpose elements, each of which defines a single transposition. In this example two alternative readings are provided, but no preference is indicated. While the author apparently first composed the line ‘Alone before his native river -’, at some later point, he entertained the possibility of using the word beside instead of before. The manuscript supplies no indication of which word Moore favours at this point, although in fact, in the first printed edition of Lalla Rookh the word beside was chosen. The mode attribute here indicates that the two possible readings indicated by the target attribute are mutually exclusive. The weights attribute indicates the relative importance or preference to be attached to the two readings on a scale running from zero (most improbable) to one (most probable). In this case, we have a very strong preference for the second reading because this is the one that appears in the published version of the poem. The alt element is further discussed in section 16.8 Alternation. The use of elements such as del and add necessarily implies that the modifications they indicate were made at some time after the original writing. An exception to this is where a false start or ‘instant’ correction has been identified: the author starts to write, and then immediately corrects what has been written. The instant attribute defined by this module may be used on any element which is a member of the att.editLike class to modify this default assumption. When the value of instant is set to true, the addition or deletion is considered to belong to the same change as its parent element, while false means some change later than that of its parent. The function of the surface element is both to identify a specific area containing writing and to provide a two dimensional set of coordinates which can be used to position and provide dimensions for sub-parts of it. Furthermore, surfaces may nest within other surfaces, as in the case of ‘patches’ or other written materials attached to the main writing surface. In the general case, the position and dimensions of such nested surfaces will be defined using the same coordinate system as that supplied by the parent surface element. It is also possible, however, that a different coordinate system is required for such a nested surface, perhaps because it requires a more complex granularity. We consider both possibilities. In this version of the encoding, the inner surface, corresponding with the first piece of newsprint, inherits locational information from the zone element that contains it. This zone, and the preceding one, which contains a sequence of line elements, are both positioned in terms of the coordinates specified on the outermost surface element, which defines a scale running from 0 to 50 in either direction. On that scale, the line elements occupy a rectangle with coordinates (1,1,10,10), while the nested surface occupies a rectangle with coordinates (4,4,20,20). As before, the second zone defines the position and size of the newspaper patch itself in terms of a coordinate system running from 0 to 50 on both X and Y axes. The nested surface element however defines a new scale for all of its components, running from 0 to 100 on both X and Y axes. The position of the nested zone containing the text Spring ... steamer is now given in terms of this scale. All of the examples so far given have involved rectangular zones, for clarity of exposition. As noted above, the points attribute may be used to define non-rectangular zones as a series of points. For example, in the last of the Whitman examples discussed in section 11.3.4.2 Metamarks above, we might wish to record the exact shape of the zone containing the metamark Entered. Since this is not a rectangular zone, we use the points attribute to indicate the points defining a polygon which contains it. The values used are expressed in terms of a coordinate space running from 0 to 229 in the X dimension, and 0 to 160 in the Y dimension. 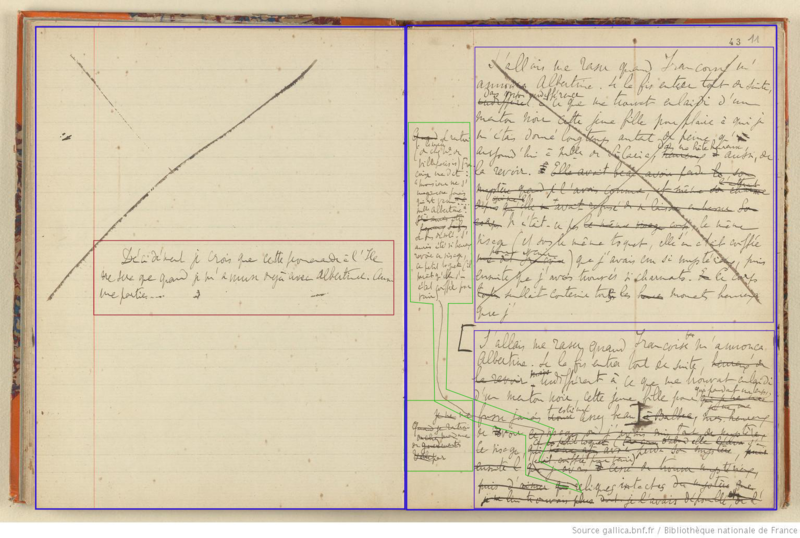 The coloured lines added to this image indicate a number of zones of writing, colour coded to indicate the order in which they were written (purple, then green, then red). For example, the zone marked in red on the left contains a note referring to the purple zone on the right. This approach assumes that the transcription will primarily be organized in the same way as the physical layout of the source, using embedded transcription elements. Alternatively, where the a non-embedded transcription has been provided, using the text element, it is still possible to record gathering breaks, page breaks, column breaks, line breaks etc in the source, using the elements described in section 3.10 Reference Systems. Detailed metadata about the physical make-up of a source will usually be summarized by the physDesc component of a msDesc element discussed in 10.7 Physical Description. The author or scribe may have left space for a word, or for an initial capital, and for some reason the word or capital was never supplied and the space left empty. The presence of significant space in the text being transcribed may be indicated by the space element. space indicates the location of a significant space in the text. Note that this element should not be used to mark normal inter-word space or the like. Here, the fact of the space within the manuscript is indicated by the value of the reason attribute. The source of the supplied text is shown by the value of the source attribute as the Hengwrt manuscript; the transcriber responsible for supplying the text is ES. Where the area of text marked overlaps other areas of text, for example crossing a structural division, one of the spanning mechanisms mentioned above must be used; for example where the line is thought to mark a deletion, the delSpan element may be used. Where it is desired simply to record the marking of a span of text in circumstances where it is not possible to surround the text with a hi element, the span element may be used with the rend or type attribute indicating the style of line-marking. More work needs to be done on clarifying the treatment of other textual features marked by lines which might so overlap or nest. For example, in many Middle English manuscripts (e.g. the Jesus and Digby verse collections), marginal sidebars may indicate metrical structure: couplets may be linked in pairs, with the pairs themselves linked into stanzas. Or, marginal sidebars may indicate emphasis, or may point out a region of text on which there is some annotation: in many manuscripts of Chaucer's Wife of Bath's Prologue lines 655–8 are marked with nesting parentheses against which the scribe has written nota. Such features could be captured by use of the note element, containing a prose description of the manuscript at this point, enhanced by a link to a visual representation (or facsimile) of the feature in question. For example, in the Chaucer example just cited, one may wish to record that the nota is written in the Hengwrt manuscript in the right margin against a single large left parenthesis bracketing the four lines, with two right parentheses in the right margin bracketing two overlapping pairs of lines: the first and third, the second and fourth. The note element allows us to record that the scribe wrote nota, but is not well-adapted to show that the nota points both at all four lines and at two pairs of lines within the four lines. The metamark element discussed in section 11.3.4.2 Metamarks above provides better facilities for this kind of complex annotation. Such information as page numbers, signatures, or catchwords may be recorded in a specialized fw element provided for that purpose. Although the name derives from the term forme work, used in description of early printed documents (the ‘forme’ being the block used to hold movable type), the fw element may be used for such features of any document, written or printed. Note that the purpose of this element is to record page numbers etc. actually present in the document being encoded, not necessarily to provide a complete or accurate pagination of it. Information about pagination etc. may also be provided using the n attribute of the pb or gb elements, or by other appropriate milestone elements, as further discussed in section 3.10 Reference Systems: since this information is usually provided by the encoder, it is not subject to the constraint that it should be present only if textually present in the source being encoded. In text-critical situations it may be useful to provide both a normalized version of the pagination and a representation of the catch-word or numbering, especially when the latter presents a variant reading, or is significant for compositor identification. fw (forme work) contains a running head (e.g. a header, footer), catchword, or similar material appearing on the current page. It should not be used for marginal glosses, annotations, or textual variants, which should be tagged using gloss, note, or the text-critical tags described in chapter 12 Critical Apparatus, respectively. a way to characterize each such change, in itself and in relation to others. The listChange element carries an attribute ordered, which can take the values true or false (the default). The attribute specifies whether the order of child elements signifies a temporal order for the revision campaigns which they document. In the example above, the editor has asserted that the four sets distinguished are ordered chronologically according to the order of the change elements. If necessary, listChange elements can be nested hierarchically. This may be helpful in two cases. Firstly one can build up hypotheses about related revisions step-by-step, starting with change elements of smaller coverage, whose members are certainly related, and then in a subsequent pass grouping these in turn, thereby extending their reach. A nested listChange elements is also useful to indicate a partial ordering of change elements. In addition to the possibility of being ordered by their sequence within a listChange element, change elements may carry a number of attributes from the att.datable class (period, when, notBefore, notAfter, from, and to) which allow each element to be dated as exactly or inexactly as necessary, in the same way as is currently possible for the TEI date element. Each change element, apart from declaring a distinct moment or phase in the creation of the document, may also contain references to other annotations contained within the teiHeader or in the document (as shown in the previous example). Such references, along with the textual content, are purely documentary. The association between a textual component and a change element is always made explicitly, either by using the target attribute on the change element to point to one or more textual elements, or by pointing from the element or elements concerned to the change element by means of their change attribute. If a change element is associated with some element, it is also associated with all of that element's children, unless otherwise indicated, for example by a new value for the change attribute. Note that in this case both the deletion and the addition are associated with the second change element. The word ‘house’, because its deletion forms part of this second set of alterations, must have been present originally, whereas the word ‘mouse’ must have been added during the second set of alterations. Elements such as add and del and the like carry an implied semantics concerning the order in which events in the writing of a document was carried out: something which is deleted must have been written before it was deleted; something which is added must have been added at a later stage of the writing. Even when a combination of such elements is used, the chronology can usually be inferred (see further 11.3.3.2 Use of the gap, del, damage, unclear, and supplied Elements in Combination). Explicit indication of the set of alterations to which some modification belongs is mostly useful in situations where all the alterations identified in a document are to be grouped, for example chronologically. The documentary transcription stresses the writing process, while the textual transcription emphasizes textual alterations. In either case, the change of writing activity associated with a particular feature in the transcript is explicitly indicated. From the documentary perspective, by assigning particular modifications to a specific change element, we describe the writing process, in that they specify which segment has been written when . From the textual perspective, the markup concentrates simply on the existence of textual alterations and makes no explicit claims about the order of writing. We repeat the advice given at the beginning of this chapter, that these recommendations are not intended to meet every transcriptional circumstance ever likely to be faced by any scholar. They are intended rather as a base to enable encoding of the most common phenomena found in the course of scholarly transcription of primary source materials. These guidelines particularly do not address the encoding of physical description of textual witnesses: the materials of the carrier, the medium of the inscribing implement, the organisation of the carrier materials themselves (as quiring, collation, etc. ), authorial instructions or scribal markup, etc., except insofar as these are involved in the broader question of manuscript description, as addressed by the msdescription module described in chapter 10 Manuscript Description. The image is taken from the collection at http://ancilla.unice.fr/Illustr.html, and was digitized from a copy in the Bibliothèque Municipale de Lyon, by whose kind permission it is included here.